Online art auctions are becoming more and more popular as a way for collectors to find and purchase fine contemporary art, even in the world of glass. Exemplary artists such as Ann Wolff, who first gained attention in the late 1960s as a founder of the international Studio Glass Movement, have sold pieces for thousands of dollars through online auctions with major houses such as Christie’s. Many people who bid for artwork online may have never seen the piece in real life. If an item arrives and is not in the condition promised (or worse, turns out to be a forgery), many auction sites offer full refunds. However, the time limit to be eligible for those refunds may be anywhere from a few weeks to a few years. Check with the terms and agreements of every auction before you buy. Some online-only auction houses are less thorough in their research and write-ups of the artwork for sale. While the time and expenses saved from this procedure can translate to more favorable purchasing prices, it also requires more research and knowledge on behalf of the buyer herself. Consult with an expert if you have any lingering questions. Unlike brick-and-mortar auction houses, online art auction sites don’t necessarily have to reveal whether certain items go unsold at auction. This missing information can obscure the valuation of a piece or similar items, which are largely based on the prices people are or are not willing to pay for them. In the end, however, online art auctions are a tremendous way to grow any collection, from anywhere around the world. Is your art collection missing something? Click around and discover modern glass artwork for the discerning collector or gallery owner. Much like the rest of the world, the contemporary art world is increasingly moving business into the digital realm. A full 71% of art collectors say they have purchased art online in some fashion. Even the major auction houses like Sotheby’s and Christie’s now have online art auction sites, where collectors can bid and buy from anywhere on the globe with the click of a mouse or a swipe of the finger. However, online art auction sites can be intimidating for the uninitiated. Here are a few tips, suggestions, and pointers for collectors eager to expand their purchasing options and find valuable deals through the web. As with any auction, it’s important to go into the sale knowing as much as you possibly can about the work, its condition, its value, its artist, its history, and more. This information can help you determine a fair asking price for the piece and help prevent you from overspending. Alternatively, it might help you snag a great deal on an undervalued work. It’s easy to get caught up in the excitement of online bidding. If you don’t set firm limits, you may find yourself overextending your wallet in the heat of the chase. 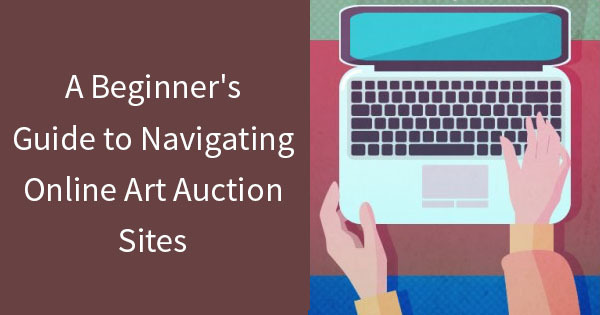 Predetermine a maximum bid — and make sure it accounts for any extra auction fees or shipping costs. Be sure to consider the value of the object not only in terms of its market worth, but its personal value as a part of your collection. 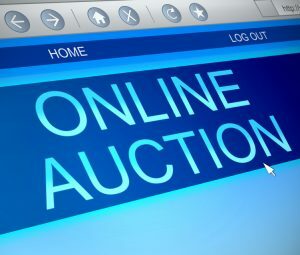 Too much hesitation in your bids can result in lost opportunities, especially in the rapid-paced world of online art auction sites. Try to bid “live” as much as possible, rather than sending in an absentee bid. You’re much more likely to secure the pieces you want at better prices when you’re able to control your bidding as precisely and effectively as possible. Online art auction sites open up many opportunities for collectors and art enthusiasts that wouldn’t have been possible in an age before the Internet. You may miss hearing the sound of the closing gavel, but you’ll love the new chances to capture beautiful and rare pieces from around the world, no matter where you are. It’s no surprise or secret that the contemporary art realm has been greatly affected by the digital revolution. Even the world’s leading auction houses, such as Christie’s and Sotheby’s, now offer regular online art auctions. 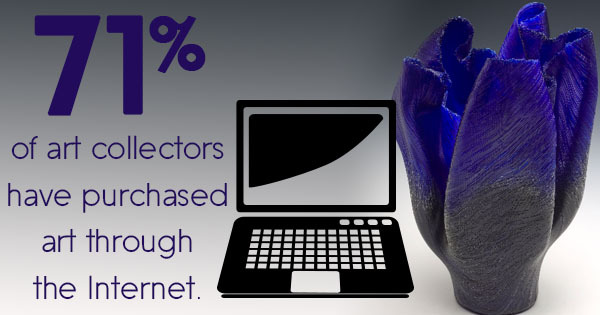 Additionally, some 71% of art collectors have purchased art through the Internet. Far from signifying the end of the auction era, digital trends have actually helped improve many of the services offered by auction houses and opened up a world of beauty for many new buyers. Here are just a few of the ways auction houses and their customers have benefited from digital technology. Real-time access from anywhere in the world. You can be in Dallas or Dubai and still bid on fantastic art pieces up for auction in New York City or Paris. Instantaneous access and live-streaming technologies allow for the same energy and excitement as an in-person auction event, all from the comfort of your own home or hotel room. Much of global finance is now done through the web, and secure payments can be delivered in an instant. This makes transactions much easier for buyers and sellers alike. Glass artwork in particular can be difficult to transport, especially since 70% to 74% of the weight of modern glass is pure silica, or fused quartz. While 90% of glass used today is enriched with lime, that doesn’t make it any less fragile. Online auctions allow pieces to be transported only once, often directly from artist to collector, saving many unnecessary and precarious trips in between. Bringing art to the masses. One of the best things to come of the digital revolution is that anyone, anywhere, can study and appreciate art without necessarily having to go to a museum or gallery to see it. This has expanded an interest and knowledge in the field, encouraging young people to expand their artistic horizons and further the potentials of creative expression. Not everyone feels at home in the digital realm, and plenty of auction houses still hold traditional events for in-person bidding. Still, the many ways that online auctioning has expanded the art world should serve as an inspiration for artists, collectors, and dealers alike.